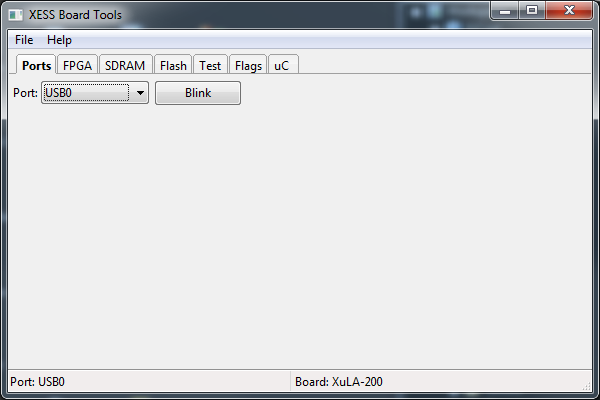 Test XESS XuLA FPGA boards. Download configuration bitstream files to their FPGAs. 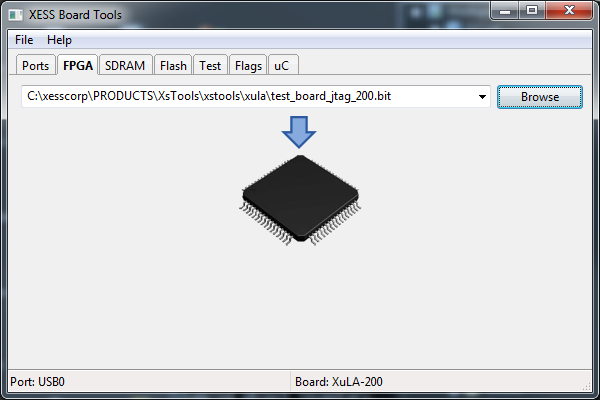 Upload and download the onboard SDRAM. Program and read the serial flash. Program and verify the code in the USB interface microcontroller. Set flags that control behavior. Run self-test on an XESS board. -u N, --usb N The USB port number for the XESS board. If you only have one board, then use 0. -m, --multiple Run the self-test each time a board is detected on the USB port. -v, --version Print the version number of this program and exit. Program a bitstream file into the FPGA on an XESS board. Upload from RAM or flash the data between the lower and upper addresses. --usb N The USB port number for the XESS board. If you only have one board, then use 0. Change configuration flags on an XESS board. Turn the auxiliary JTAG port on or off. -r, --read Read the flag settings from the XESS board. 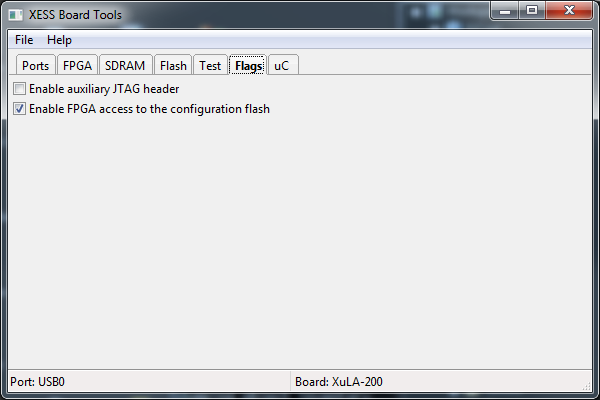 The setting of the flash flag has no effect on the XuLA2 boards because the serial flash is always accessible to the FPGA. 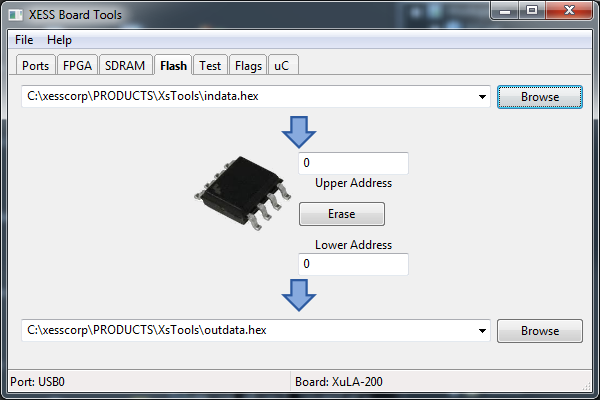 Program a firmware hex file into the microcontroller on an XESS board. The name of the firmware hex file. -m, --multiple Program multiple boards each time a board is detected on the USB port. --verify Verify the microcontroller flash against the firmware hex file. gxstools provides the same functions as the command-line tools, but with a GUI wrapper. The Ports tab allows you to select the USB port you will be working with. The port and the type of board attached to it are shown in the status bar at the bottom of the tab. Pressing the Blink button will cause the LED to blink on the board attached to the selected USB port. Typing the filename directly into the text field. Using the Browse button to go to a directory and select a bitstream file. Using drag-and-drop to drop a file into the text field. Once a file is entered in the text field, clicking on the downward-pointing arrow will load the bitstream in the file into the FPGA. 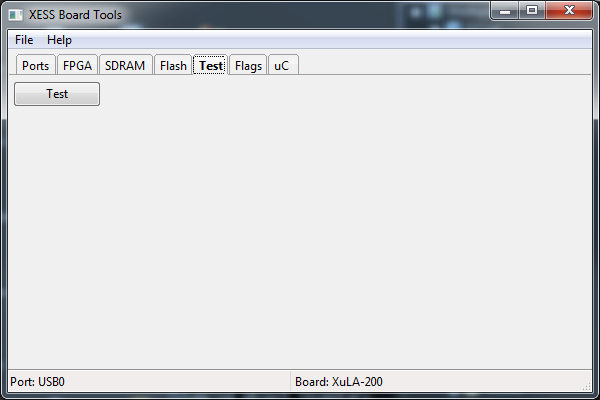 The text field maintains a history of all the files that have been downloaded to the FPGA. This makes it easy to go back and reload the FPGA with a bitstream. The SDRAM tab lets you download and upload data to/from the SDRAM. 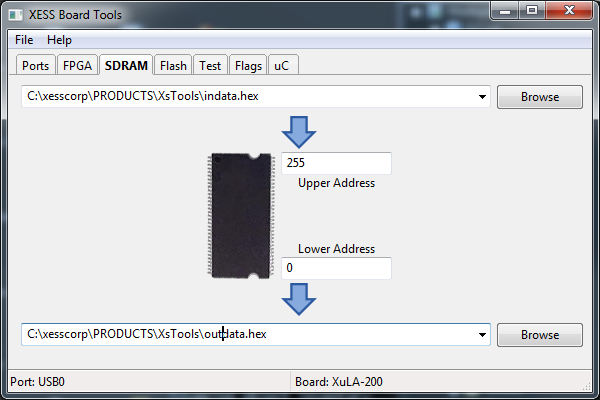 The data in an Intel HEX file can be downloaded into the SDRAM by entering the file name into the upper text field and then clicking on the upper downward-pointing arrow. Similarly, data between the values typed into the Upper Address and Lower Address fields will be loaded into the file whose name is entered into the lower text field once the lower downward-pointing arrow is clicked. The serial flash can be handled in the same manner as the SDRAM by using the Flash tab. The only additional feature is that the flash can be loaded with an FPGA configuration bitstream by entering a .bit file into the upper text field. The Flags tab lets you set the various flags for the board. The current settings for the flags are indicated by the state of the checkboxes. 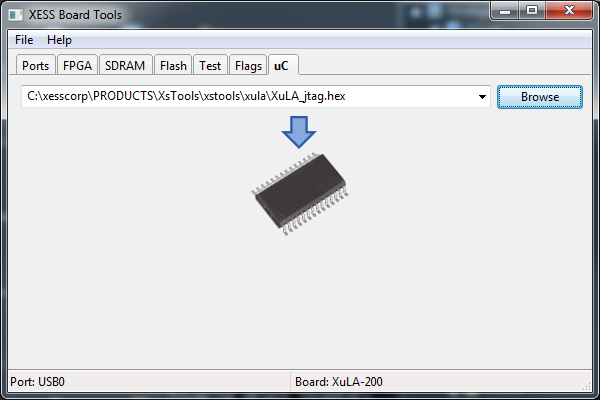 The microcontroller can be reprogrammed by entering the name of an Intel HEX file into the text field of the uC tab and clicking on the downward-pointing arrow.